Welcome to the website of the Harutyunyan Research Group, which is embedded in the Stratingh Institute for Chemistry of the University of Groningen. The interests of our group span the disciplines of catalysis in organic and organometallic chemistry with an emphasis on emergence of chirality, elucidation of mechanisms. 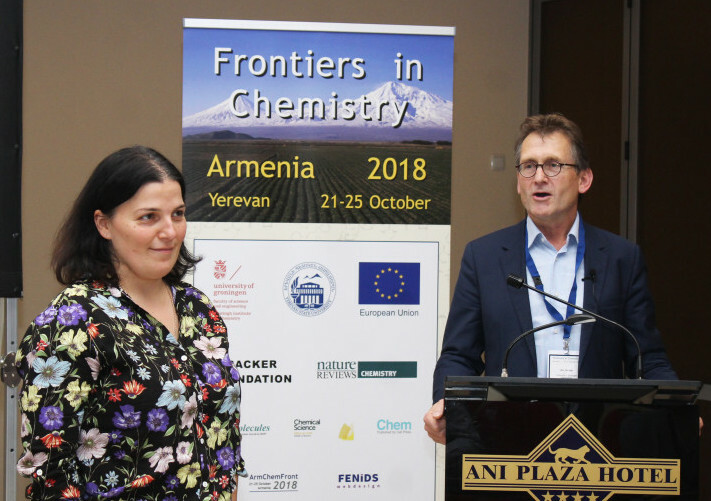 We are looking back at a very successful second "Frontiers in Chemistry, Armenia" conference, which took place from October 21-25 2018 in Yerevan. With 22 invited and 36 contributed talks, a well-attended poster session, and speakers and participants (including Nobel Prize winners Ben Feringa and Sir Frazer Stoddart) from Armenia and all over the world, the scientific program was of an outstanding level. Combined with a cultural program highlighting the history and culture of Armenia, the event provided a platform for both scientific and cultural exchange. Pictures and all abstracts can now be found on the conference website linked below.Thanks to all sponsors and participants for making it such a rewarding and enjoyable week! On June 25th 2018 the board of the University of Groningen approved Syuzanna Harutyunyans promotion to full professor and Chair of Homogeneous Catalysis. The Netherlands Organisation for Scientific Research (NWO) has awarded Prof. Harutyunyan a Vici career award. This grant, intended for 'excellent, experienced researchers' will be used to develop more efficient and environmentally friendly alternatives for existing methods for the production of pharmaceutically relevant compounds. Today the European Research Council announced that Prof. Syuzanna Harutyunyan is among the awardees of the 2017 ERC Consolidator grants. This prestigious grant for mid-career scientists is meant to stimulate the most original and ambitious fundamental research projects. With this grant Prof. Harutyunyan will apply her groups recent groundbreaking discoveries in combining Lewis acids, Grignards and copper catalysis to dearomatisation chemistry. The Royal Society of Chemistry has honoured Prof. Syuzanna Harutyunyan with their 2017 Homogeneous Catalysis Award. Recognising outstanding research in homogeneous catalysis, the award is granted every two years, with the winner making a lecture tour through the UK. The date and location of the award ceremony will be announced later. On Wednesday December 7th Prof. Syuzanna Harutyunyan received the KNCV Gold Medal 2016 from KNCV chairman Prof. Floris Rutjes. The award ceremony was held during the CHAINS conference and included a lecture by Prof. Harutyunyan. 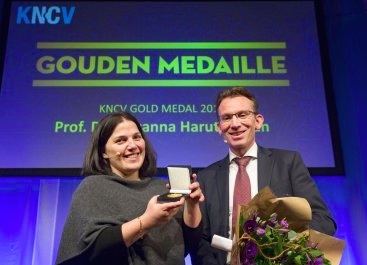 Awarded to a top chemical talent every year, the KNCV Gold Medal has become the premier prize for researchers in the chemical sciences in the Netherlands. We are thrilled to be able to congratulate our friend and colleague Prof. Ben Feringa as the 2016 Nobel Prize for Chemistry laureate! "Ben's greatest strength is his ability to inspire people with his creativity and real passion for science", comments Prof. Syuzanna Harutyunyan, who collaborated with Prof. Feringa on the nano-scale car. "Seeing his willingness to try new things rewarded like this is a motivation for us all." Today the KNCV (Royal Dutch Chemical Society) announced that Prof. Syuzanna Harutyunyan will be awarded the 2016 KNCV Gold Medal. Syuzanna is lauded by the jury for her careful analyses of chemical problems and ingenious designs for solving them. 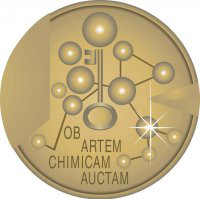 The KNCV Gold Medal is awarded yearly to top chemical talents and is the premier prize for researchers in the chemical sciences in the Netherlands. The award ceremony will take place on December 7th during the CHAINS 2016 conference in Veldhoven. 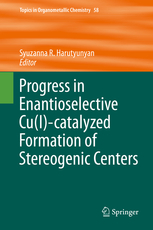 The book "Progress in Enantioselective Cu(I)-catalyzed Formation of Stereogenic Centers", edited by Syuzanna Harutyunyan is out. It appeared in the Topics in Organometallic Chemistry series from Springer publishers, and provides an in-depth overview of the progress made in Cu(I) catalysis during the period 2010 - 2015. The book can be ordered from Springer via their website linked below. Our paper "Catalytic asymmetric addition of Grignard reagents to alkenyl-substituted aromatic N-heterocycles" is out and appears in today's edition of Science! Congratulations to Ravi, Francesco and Marieke! Prof. Harutyunyan has been awarded a €260.000 ECHO grant from NWO (the Netherlands Organisation for Scientific Research) to further develop a groundbreaking method for the catalytic, asymmetric synthesis of chiral C-tertiary amines. The novel strategy relies on one-pot alkylation/aza-Brook-rearrangement/carbanion trapping techniques, and promises to afford these important organic, chiral molecules in an efficient, catalytic manner. 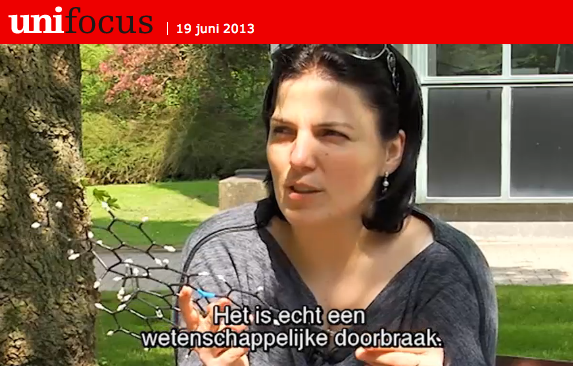 In June 2013, the video magazine of the University of Groningen Unifocus highlighted Syuzanna R. Harutyunyans work on the invention of a nano-scale 4-wheel-drive, which made it to the cover of Nature. The video can be found via the link below. On June 1st 2013 Syuzanna R. Harutyunyan was promoted to a tenured associate professorship (adjunct hoogleraar) by the University of Groningen. Dr. Harutyunyan is one of the organizers of the international chemistry conference Frontiers in Chemistry, Armenia that will be held from 25 to 29 August 2013 in Yerevan, Armenia. World-renowned speakers on a variety of topics will ensure an enticing program, in a both stunning and culturally interesting location. For more information (and registration!) please visit the conference website. Dr. Syuzanna R. Harutyunyan was selected to represent the Netherlands in the next Young Investigator Workshop organized by the Organic division of EuCheMs. The workshop, taking place from July 4-6 2013 in Marseille, is an annually recurring event for which at most 30 young researchers are selected. It is one of the most important young investigator networking events for organic chemists in the world. On October 3rd 2012 Syuzanna Harutyunyan gave a talk at the TEDxHanzeUniversity event. During this contribution she discussed the nanoscale 4-wheel drive that a team of scientists co-lead by her constructed, and that made it to the cover Nature in November 2011. The video of this presentation is now available on youtube and on the TED website. 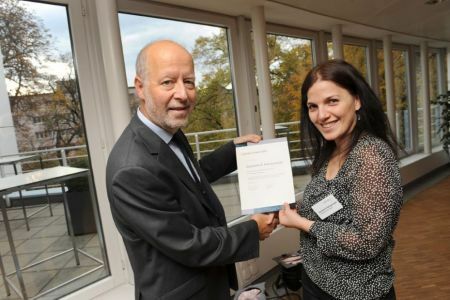 Dr. Harutyunyan has been awarded the prestigious VIDI award by the Netherlands Organization for Scientific Research (NWO) for her proposal "New concepts in sustainable catalytic asymmetric carbon-carbon bond formation". The award of €800,000 will allow her to expand her research into new, cost-effective methodologies for synthesizing chiral alcohols/amines. This should unveil new insights into the role of Cu(I)-chemistry in asymmetric catalysis and lead to novel synthetic routes to highly valuable chiral molecules with immediate impact in both academia and industry. We have constructed the tiniest ever electrically driven car, which consists of a single molecule. Powered by electrons as fuel, the nanoscale car can propel itself in a straight line across a surface, using four independent motors that at the same time function as its wheels. 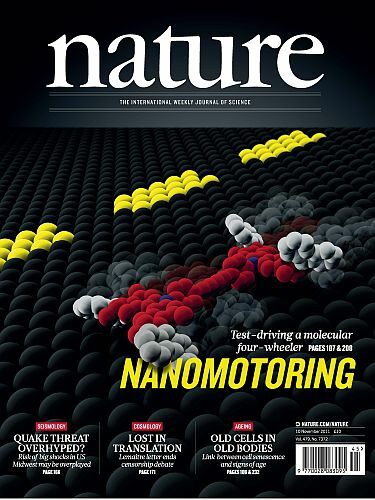 The design and synthesis of this "molecular 4-wheel-drive" took 2 years, but was rewarded by being selected to grace the cover of the Nature issue of 10 November 2011. The jury of the annual Solvias Ligand Contest awarded the 2011 prize to Dr. Syuzanna R. Harutyunyan, Assistant Professor in Synthetic Organic Chemistry at the University of Groningen. The Award Ceremony and presentation of the prize-winning contribution took place during the 10th Science Day.